Marine Corps ammunition technicians work in every facet of the ammunition field, including receiving, storing, issuing and handling ammunition and toxic chemicals. They handle conventional ammunition as well as more sophisticated weaponry such as guided missiles, large rockets, explosives and other types of explosives. Needless to say, this is not a job for everyone; it requires a steady hand, patience and the ability to stay calm under pressure, even when handling highly sensitive materials. The Marine Corps considers this a primary military occupational specialty (MOS), and categorize it as MOS 2311. It's open to enlisted Marines between the ranks of private and master gunnery sergeant. These Marines are responsible for safely handling and disposing of the types of ammunition listed above, as well as other explosive devices. This isn't a combat job, where you'll be handling improvised explosive devices (IEDs), but rather will be keeping track of and organizing ammunition where and when it's needed by various platoons and missions. In addition, they conduct supply stock control of ammunition and use Marine Corps-approved accounting methods to make sure no weapons or explosives are missing. They also inspect weapons and weapons systems to determine if they have become unstable or are too old, and need to be repaired or destroyed. To be eligible for this job you'll need a score of 100 or higher on the general technical (GT) section of the Armed Services Vocational Aptitude Battery (ASVAB) tests. 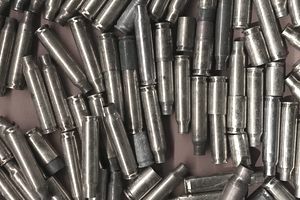 A secret security clearance from the Department of Defense is also required of ammunition technicians since they handle sensitive material and information. This involves a background check of character and finances, which will look for any criminal activity. A history of drug use or alcohol abuse may be grounds for denying such a clearance. In addition, you should have no convictions by court-martial, civilian courts, or nonjudicial punishment involving larceny, theft or trafficking of controlled substances. Marines in this job also need to be qualified and be eligible for certification to handle ammunition and explosives. You'll also need to have normal color vision and be a U.S. citizen to qualify for this job. After boot camp, you'll take the enlisted ammunition specialist course in Redstone, Alabama. You'll learn about explosives demolition operations and handling and processes for cataloging and distributing ammunition and explosives to Marine Corps personnel. If you have an interest in algebra, chemistry, physics, geometry or trigonometry, these will be useful as you prepare for this course. You should be able to communicate effectively and be adept at planning and organizing.